Assessment is top of mind in schools these days. Teachers are required to use assessments continuously in their practice, from initial Kindergarten readiness assessments to high school exit exams to accountability-driven provincial testing programs. Increasingly, teachers across grades are also expected to engage students in ongoing assessments during learning periods to provide regular formative feedback about their progress in relation to provincial standards.1 Clearly, teacher assessment fluency has become a fundamental skill for teaching in today’s schools. So, what does it mean for a teacher to be fluent in assessment? And, more importantly, what does it look like in practice? Fluency – the skill to communicate with ease in a language – has the Latin root word fluere, “to flow.” For teachers, then, we conceptualize assessment fluency as the skill to integrate and use assessments within the flow of teaching and learning. Assessment fluency combines teaching, curriculum, and assessment to effectively support and report on student learning in classrooms. Despite its importance, research suggests that many teachers do not feel sufficiently prepared to effectively use assessment in their classrooms to optimize student learning.2 In this article, we present eight key dimensions of assessment fluency as a framework for enhancing classroom assessment practices. In the past two decades, defining assessment fluency has been a focus of research and policy worldwide.3 Since the 1990 publication of the influential Standards for Teacher Competence in Educational Assessment of Students, a number of documents have been developed to articulate standards for classroom assessment and to guide teacher practice. providing effective assessment education and support for teachers. 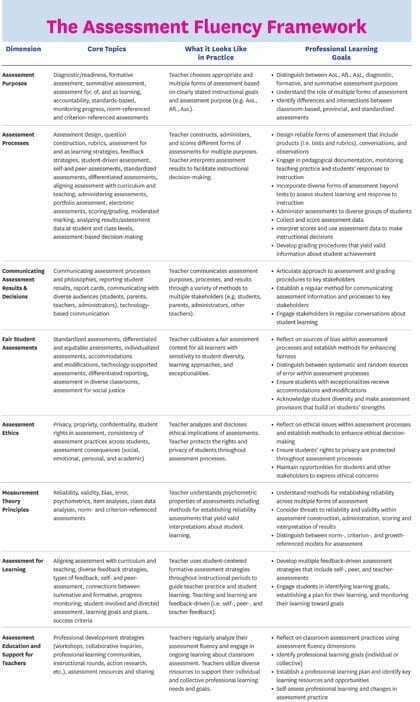 Each of the eight dimensions reflects key considerations when assessing student learning, and combined they represent a framework for understanding and supporting assessment fluency. This framework serves as a tool to help teachers unleash the power of assessment fluency in practice. In the table on pp. 41-42, we identify core topics related to each of the eight dimensions of assessment fluency, then describe what it looks like in practice. We also provide key professional learning goals to support the teachers’ development across the dimensions. How do I define and distinguish between assessment for, as, and of learning? Do I understand when to use diagnostic, formative, or summative assessments in my classroom? How do I use the information gained from these assessments to support teaching and learning? How do I ensure alignment between various assessments used in my classroom and provincial curriculum expectations? Teachers can then use the learning goals identified in the framework to target areas for personal learning. Similarly, school and district administrators can use the Assessment Fluency Framework to determine professional learning strengths and goals in assessment across classrooms in schools and across schools in districts. Goals can then be incorporated into school and district improvement plans, providing the basis for professional learning opportunities for teachers. These opportunities might include school-based collaborative inquiries focused on specific aspects of classroom assessment or district-wide professional development sessions for teachers with assessment experts. Becoming assessment fluent is a career-long pursuit requiring sustained and intentional professional learning. This framework provides a tool to engage focused learning toward teachers’ effective use of assessment information in their classrooms. Supporting teacher learning in assessment across schools and districts will ultimately ensure that students gain the benefit of assessment-driven teaching. Want to learn more about your approach to classroom assessment? Try the Approaches to Classroom Assessment Inventory (ACAI) at http://educ.queensu.ca/acai and generate your personal assessment profile. Based on your profile, you can identify and select personal learning goals to enhance your assessment fluency. En Bref : L’évaluation constitue une compétence essentielle pour enseigner dans les écoles contemporaines. Cet article présente huit dimensions destinées à soutenir et à renforcer la maîtrise de l’évaluation par les éducateurs et à améliorer les pratiques d’évaluation en classe. Les sujets fondamentaux et objectifs d’apprentissage de chaque dimension sont indiqués pour guider l’apprentissage professionnel des enseignants en évaluation. 1 C. DeLuca, L. Volante and L. Earl, “Assessment for Learning across Canada,” Education Canada 55, no. 2 (2015): 48-52. 2 C. A. Mertler, “Teachers’ Assessment Knowledge and their Perceptions of the Impact of Classroom Assessment Professional Development,” Improving Schools 12, no. 2 (2009): 101–113; L. Volante and X. Fazio, “Exploring Teacher Candidates’ Assessment Literacy: Implications for teacher education reform and professional development,” Canadian Journal of Education 30 (2007): 749-770. 3 C. M. Gotch and B. F. French, “A Systematic Review of Assessment Literacy Measures,” Educational Measurement: Issues and Practice 33 (2014): 14-18; S. Brookhart, “Educational Assessment Knowledge and Skills for Teachers,” Educational Measurement: Issues and Practice 30 (2014): 3–12. 4 C. DeLuca, D. LaPointe and U. Luhunga, “Teacher Assessment Literacy: A review of international standards and measures,” Educational Assessment, Evaluation, and Accountability 21, no. 4 (2016): 248-266.